Democratic Sen. Doug Jones, a former prosecutor, said he doubts that the long-awaited report from special counsel Robert Mueller's office will be the "blockbuster" that many of President Donald Trump's critics are hoping for. On the other hand, Jones said, he also doubts that the report will contain "information that's going to exonerate a lot of people, as the president's supporters would suggest and would hope." 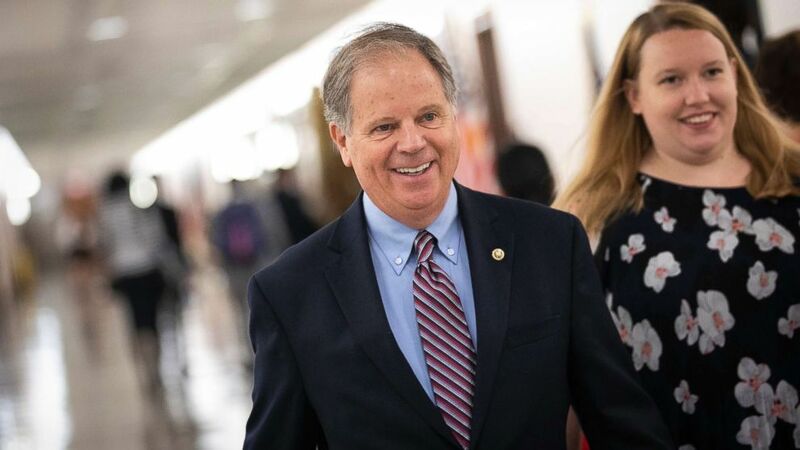 On the "Powerhouse Politics" podcast Tuesday, the senator from Alabama talked to hosts ABC News Chief White House Correspondent Jonathan Karl and Political Director Rick Klein about the possible outcomes of the special counsel's report. In his experience, when attorneys decide not to prosecute, "in the overwhelming number of cases the file is simply closed," Jones said. However, he added, "your questions were framed to me in a normal circumstance. This is not a normal circumstance." When the report is released, if lawmakers believe an unreasonable amount of the information has been withheld from the public, Jones said, "I think you'll start seeing some congressional action on both sides of the aisle and in both houses to try to get a more complete and full report." Jones said he thinks there could be a risk that Democrats will overreach in their investigations of the president, but added, "I don't think that that risk ... has manifested itself yet. But there's always the risk." "We really don't want to get into areas where it appears that this is solely directed at the president, as opposed to legitimate, efficient oversight," Jones said. Jones' place in Congress will likely be hotly contested in 2020. The senator won his current seat in a tight special election to replace Jeff Sessions, with tallies showing he triumphed by a 49.966-48.34 margin. His victory marked the first time a Democrat has won a U.S. Senate seat in Alabama in a quarter century and potential Republican challengers are already emerging from the woodwork. U.S. Rep. Bradley Byrne, R-Ala., announced last month that he plans to challenge Jones in 2020, according to the Associated Press, and Roy Moore, the Republican who lost to Jones in the special election, has indicated that he is considering running again. Moore's campaign was rocked by accusations of sexual misconduct, including that he initiated a sexual encounter with a 14-year-old girl when he was 32. Moore has denied the allegations. On Wednesday, Jones called Moore's announcement "almost comical to watch." "I've always believed that Moore is doing this more to raise money. That's been his M.O. for years. I don't know if he'll run or not but I think this is a fundraising tool for him," Jones said. Another uncertainty in the 2020 election is whether Jones' longtime friend, former Vice President Joe Biden, will throw his hat into the ring for the presidential race. Biden told audience members who chanted, "Run, Joe, Run" at an event Tuesday, "I appreciate the energy when I got up here. Save it a little longer -- I may need it in a few weeks." ABC News has previously reported that people who have spoken to Biden in recent weeks said he is "90 percent there." "I think that he is very close," Jones said Wednesday. "But you never know." Jones noted that he hadn't spoken with Biden in a couple of weeks. "It's such a personal decision and it's such a big decision," Jones said. "I think he can offer a benefit to the country, should he both run and be elected." But, Jones pointed out, there are no guarantees in the crowded competition of Democrats vying to face off against Trump in 2020. "I thought, quite frankly, my friend Sherrod Brown was going to be in. And he surprised me the other day with deciding not to," Jones said. Following visits to several early-voting states, the Democratic senator from Ohio, announced on March 7 that he would not seek a presidential bid. Even if uncertainties remain about the Democratic presidential race, Jones said he knew one thing for certain about his own 2020 race, "Whoever ultimately I end up running against will run a campaign on division. I am absolutely convinced of that," Jones said, adding, "That's not my style." "Doesn't matter to me who the opponent is," Jones said. "I'll be back here for another term."